The French and German leaders will not discuss Eurobonds during their meeting in Paris on Tuesday. 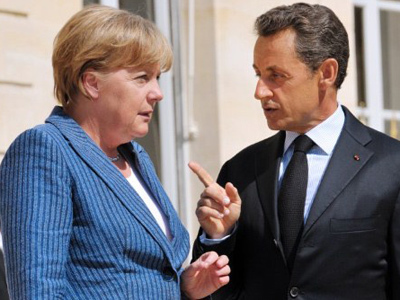 Angela Merkel and Nicolas Sarkozy are to have another go at stopping the Eurozone debt crisis from spreading. The worry is that Italy and Spain may be next in line to fail, while France is also battling to keep its credit score from being downgraded. Eurobonds are considered the panacea which would save the European economy by spreading the debt burden across the EU, transferring Northern European reliability to the southern states, which are in most financial trouble. But Germany does not want to risk losing its hard-earned reputation for economic reliability bysigning up for the Eurobond. The meeting is expected to yield some results, but there are fears that there will not be a conclusive resolution. French political science professor, Pierre Guerlain, believes that Sarkozy‘s meeting with Merkel is “pointless” in terms of solving the Eurozone debt crisis, but that it has other purposes. ”If you don’t discuss Eurobonds or solidarity within Europe than it’s not a crucial meeting at all,” Guerlain concluded. ­International consultant and former MP of the Belgian Parliament Lode Vanoost believes the meeting will be used by Sarkozy and Merkel only to boost personal ratings.